These Bicycle Brand Stripper Decks are a classic among Card Tricks. 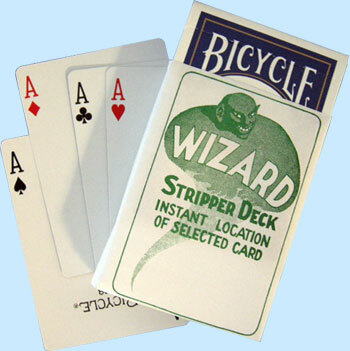 Each Stripper Deck looks just like a regular Bicycle Poker Playing Card Deck, so virtually no one can distinguish the Trick Cards from regular ones. You could even pass the cards out for examination among your audience! With Bicycle Stripper Decks, you have unbelievable control over cards that have been selected by another person and reshuffled into the deck. You can make the chosen cards appear anywhere in the deck you want – top, bottom, or middle. The deck requires no sleight of hand whatsoever.